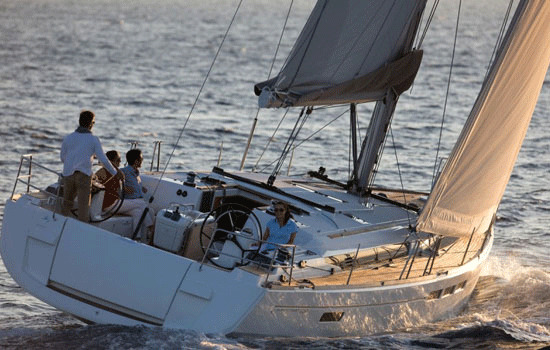 Drawing on the latest technological advances in naval architecture and design, the Jeanneau Sun Odyssey 49i embodies all the aspects expected of this world-renowned yacht builder. Designed by Philippe Briand, the Sun Odyssey 49i combines timeless design, exceptional seaworthiness and unmatched comfort. The high-aspect ratio sail plan allows for a large selection of different sails. The rig can be adapted to a variety of different types of sailing. This is one boat you will never want to get off! Semi rigid dinghy with 5hp Outboard Engine, Cabin Fans, Electric Toilet Pump, Bimini top, Sprayhood, Cockpit Cushions, Cockpit Table Linen, Towels, Snorkeling gear.. * For full specs, please Click Here.